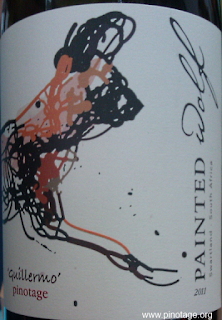 I recently tasted Painted Wolf’s 2011 Guillermo Pinotage in the company of chief wolf Jeremy Borg. It’s intensity reminded me of an Italian reciota. Jeremy explained that 10% of the grapes were vinified separately, whole bunched were fermented with their stems in a floating lid tank which was closed when almost dry and left for 6 weeks before pressing. After a year’s maturation this “super super high dry extract” was blended into the wine. Billy (Guillermo) and Penny Hughes grow the grapes in their vineyard which is now certified organic, although it was in conversion at the time of the 2011 vintage.